League action returns after the international break, and FC Barcelona have a great game in prospect at the Sánchez-Pizjuán against Sevilla FC (Saturday, 8.45pm CET). Ernesto Valverde’s men enter the final stretch of the domestic competition with an 11 point advantage over Atlético Madrid. The Basque coach is without Sergio Busquets and Lucas Digne, both of whom are out injured. For the duel in Nervión, Valverde called up the following 18 players: Ter Stegen, N. Semedo, Piqué, I. Rakitic, Denis Suárez, A. Iniesta, Suárez, Messi, O. Dembélé, Cillessen, Coutinho, Paulinho, Paco Alcácer, Jordi Alba, S. Roberto, André Gomes, Umtiti and Vermaelen. Aleix Vidal and Yerry Mina are out due to the coach’s decision, while Semedo and Denis return after receiving medical clearance. 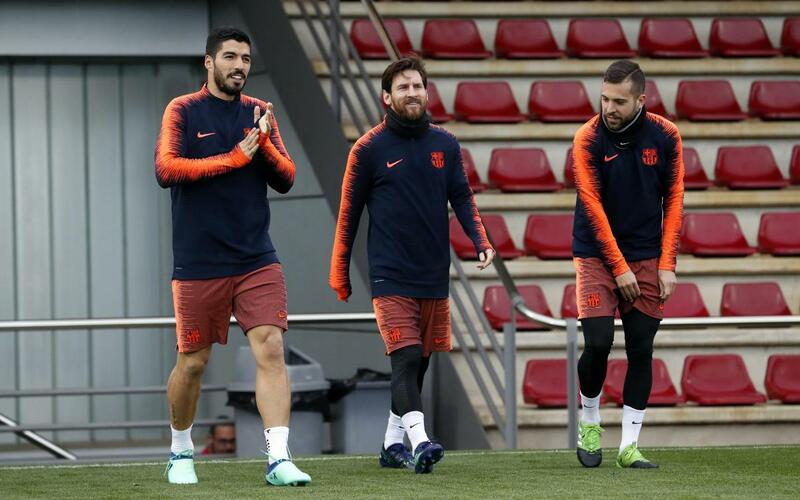 Before knowing the squad list, the first team players available, and Jokin Ezkieta from Barça B, trained on the Tito Vilanova pitch at the Ciutat Esportiva. Valverde directed a workout aimed at finalising the small details for the match in Andalusia, an important game for the destination of the title in the words of the coach.